View Racine Journal Times June 30, 1922 newspaper item. Evelyn Emma Blanche Belden was born 15 February 1902 at Honey Creek, Wisconsin. 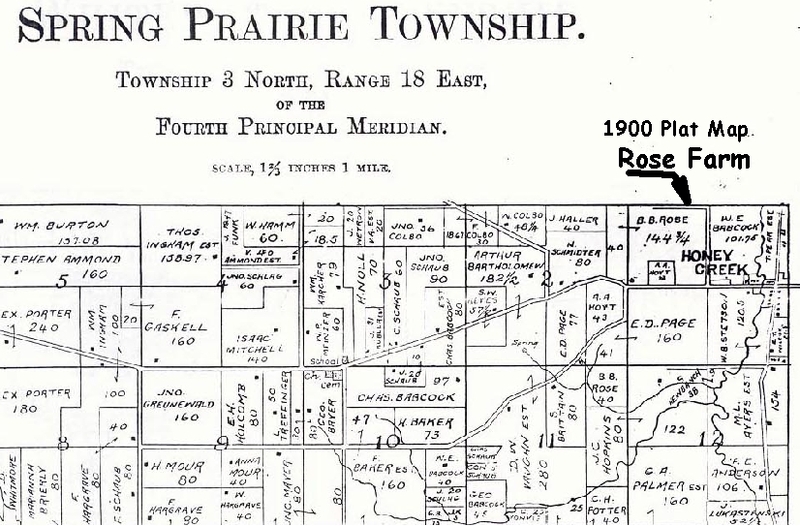 She moved with her parents to Rockford, Ill., and then, moved to Tom Miner's place, from there to farm of C. A. Glenny, in 1907, east of Roscoe, then to O. Manley Farm, in 1908, then to Andrew Roth farm, in 1910. The next move, in March, was to the McAffee house across from the Roscoe School. She went to school one year at Booth School. The rest of schooling was at Roscoe. She graduated from 2 year Roscoe High School in 1918. The graduating class consisted of two students. She worked some at Rockford Overall factory, staying at Grandma Goff's, then advanced to the Wholesale Grocery, collecting orders before shipping to stores. 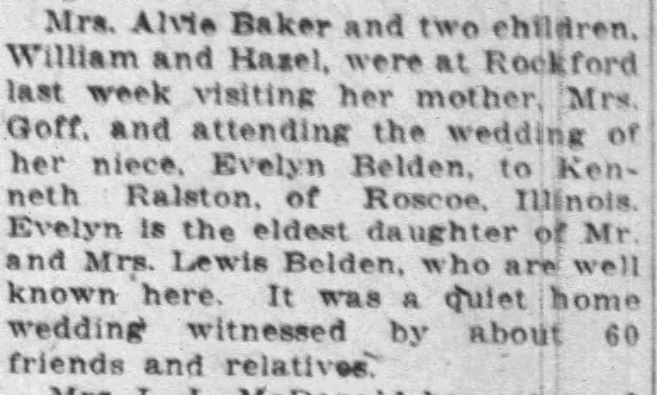 Evelyn took a course at Beloit Business College, and worked for her board caring for Bobby at R. L. Newfield home (January 1920 Federal census shows her, age- 17, with LeRoy Newfield- 28, wife, Rose- 26, and son Robert-31/2 in Beloit, Rock Co., WI) She had a short job at Chamber of Commerce. She then filled in at Iron Works a short time and, worked some time at Bicknell Supply & Co. on So. Broad Street before taking a business course. Later she was placed at J. H. Patterson in Roscoe with R. H. Perkins, Mgr., and her father, working there. It was while employed here that her future husband first saw her when he came into the office on farm business. Asa Taylor later became Mgr. She quit working there a short time before marriage. Evelyn was married on 15 June 1922 to Kenneth McAffee Ralston at her home on Elevator Road in Roscoe. Pastor was Rev. 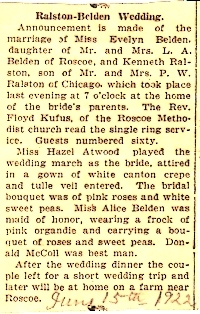 Floyd A. Kufus, Bridesmaid was Alice A. Belden and Groomsman was Donald McColl. They traveled on a honeymoon to the Grand Hotel at Janesvile and on to Wisconsin Dells at the Crandall Hotel. They took both the upper and lower Dells river trips and motored by taxi to Mirror Lake and Devil's Lake. They visited P. W. Ralston's in Chicago and took a Lake Michigan boat trip to St. Joseph, Mich. from Chicago. Evelyn lived her entire married life on the Ralston Farm south-east of Roscoe. She died at age 83, on the morning of 3 October 1985 at home. Services were conducted by Pastor Steven Plank at Delahanty Funeral Home, Loves Park and at grave side, Scottish Cemetery, Argyle. Kenneth and Evelyn had seven Children. © 2019 Harold A. Ralston, Racine, Wisconsin, USA.